Here's some interesting background on what is expected to be the largest and most far seeing telescope in the world. It's called the “Thirty Meter Telescope” (mostly because it's thirty meters wide) and the facilities are ground based and not space based. So why are we talking about it in a blog devoted to commercial space activities? We're talking about it because the funding mechanisms used for this project can be used for any university focused activity designed to build facilities for research and this even includes research covering "'rocket science" or "newspace focused science." These mechanisms also benefit entrepreneurs who should know about and be able to take advantage of them. As befitting our case study, the Thirty Meter Telescope is expensive, at almost a billion dollars to complete although the cost certainly on par with projects in other areas (such as particle physics). It's gestation and design has a strong Canadian component. Ray Carlberg, a professor of Astronomy at the University of Toronto serves as the primary point of contact for people looking to learn more about the project and explains “Canada doesn’t really have a formal process for funding large science projects." "In our case, the initial meetings occurred seven years ago through the Canadian Foundation for Innovation which contributed 10 million to match funds from Ontario, BC and the National Research Council. Then the National Sciences and Engineering Research Counsel (NSERC) contributed a further 6.5 million, which included contributions from the Universities of BC, Toronto and Victoria and the project moved forward from there” states Carlberg. US partners including the University of California and the California Institute of Technology who also provided matching funds and worked with the Canadians (by now organized into ACURA, the Association of Canadian Universities for Research in Astronomy) on the initial design and development. Construction funds became available in December 2007 with a 200 million pledge from the Gordon and Betty Moore Foundation which was leveraged into a further 100 million over the following year. "The US has pledged 300 million and we’d like the Canadian government to pledge 300 million as well to move forward with final construction,” states Carlberg, who feels the proposal is still at an early stage with the Minister of Industry but is moving forward well. So have any Canadian businesses taken advantage of this potential commitment of hundreds of millions of dollars to basic research? BC based company Empire Dynamic Structures has. The firm is acting as prime contractor for the external structure supporting the telescope and expects to develop major follow-on sales as a result of this project. It seems that the instruments used to measure the locations of each one of the 492 segments of the Thirty Meter Telescope and the actuators used to control their shape and position are also quite useful for tracking and moving people about safely as part of the billion dollar a year amusement park ride industry, a field which the firm has had great success. Empire Dynamic Structures credits it ongoing success directly to the skill-set developed two decades ago while building the external structure for the Canada France Telescope Enclosure and perceives the Thirty Meter Telescope as a logical follow-on project to maintain the skills required for continued success in this type of work. Other Canadian organizations benefiting from the design and construction work required for the Thirty Meter Telescope include the Herzberg Institute for Astrophysics (designer of the adaptive optics system) and Lyrtech (which manufacturers specialized computers to control the various mechanisms the telescope needs to remain pointed in the right direction) with a number of other companies likely to be involved as the project moves forward. So what you've got here is universities developing platforms for basic research using their own funding mechanisms, but asking for government funding to roll out the final facility and providing strong benefits to businesses who receive the final contracts. This is one of a number of models that space focused entrepreneurs should use and build on. As many of you know, much of the material that becomes part of this blog starts out as posts to either the discuss@spacecommerce.ca newsgroup (which is run by the Canadian Space Commerce Association) or the discuss@css.ca newsgroup (which is run by the Canadian Space Society). The people in these groups are quite knowledgeable, skilled and generally go out of their way to keep me well informed (and reasonably humble). One of the best sources of information from these groups is Dr. Kieran Carroll, who once acted as project manager at Dynacon back when the company worked on the MOST Telescope and now divides his time between being Chief Technology Officer at Gedex Inc., and his role as VP Technology for Space Canada. I wanted to find out how universities fund their research because of how it relates as one of the four pillars of the Canadian space industry (The first pillar is universities, where most of the initial R&D is done but they work alongside the second pillar, government which provides guidance and funding and the third pillar, private business which also provides funding, fabrication facilities and commercialization capabilities. And of course, there is also the military component, the fourth pillar, which is often overlooked because of it's security and secrecy requirements). So I asked him about money and how professors acquire enough to perform basic research. This is what he told me. Generally speaking, you learn this from being inside the system starting as a grad student (in most cases having an initially limited view as to how the money side of things works), to becoming a post-doctoral fellow (at which point you're generally assisting your professor/ employer in many things, one of which includes a "marketing" aspect), to becoming a junior professor (at which point the older profs in your department will hopefully show you the “funding” ropes). For myself, I've been a grad student, but didn't go further along the post-doc/professor route. However, in my capacity as R&D manager at several companies, I've worked closely with several university researchers and learned some things about the "system." For engineering professors in Canada, the primary source of research funding is from the National Sciences and Engineering Research Council (NSERC). Pretty much every professor applies for a basic research grant, and most of them are granted something (I’ve heard that the average is about $20K-30K per year). This funding can go towards any valid research expense which could include such items as stipends for grad students, purchasing equipment or software, attending conferences, and paying page fees for published journal articles. Via NSERC, funding is also available for taking on post-doctoral fellows. This funding is attached to the fellow, not the professor, but pays most or all of the fellow's (meager) salary for 2 years in order to relieve the professor of the burden of providing that funding (I believe the funding level is around $30-40K/year). NSERC also has programs that dispense larger amounts of funding to researchers in special cases. One program that existed in the past was the "Strategic Grant", which (in the early 1990s, which was when I ran across one of these) would provide up to about $500K for a particular research project. The proposal for this sort of project was rather more involved than the usual basic research grant proposal, of course, having to specify what the project was all about, and why it was important, presumably measuring these against some sort of NSERC-specified criteria. I believe that there are also Equipment Grants of sizes up into the hundreds of thousands of dollars, with similar proposal requirements, which can only be spent on equipment. My understanding is that both the Canadian Space Agency (CSA) and the research & development wing of the Department of National Defense (Defense R&D Canada) also have special programs in conjunction with NSERC where the agencies match NSERC funding for proposed projects approved both by NSERC and the other agency. There may also be some ability at NSERC to fund non-university researchers (although I haven't actually run across such a case, and I suspect it's rather rare). For a non-professor researcher, I believe it helps some with your NSERC applications if a university has granted you Adjunct Professor Status. In Ontario, another source of (university-only) research funding is the Ontario Centres of Excellence (OCE), which dispenses some tens of millions of dollars of Ontario research spending every year to professors whose schools have joined OCE (which is likely every university in the province at this point). These funds are passed out to professors for projects which generally must have an industry collaborator, who is normally required to pony up a significant fraction of the funds. These funds are targeted to specific areas that are selected by the four departments in OCE (there used to be a space department, but it got merged/acquired into other departments, and only a pale shadow of it remains). In years past, the Canadian Space Agency rarely dispensed research funding directly to universities, limiting itself to their CSA/NSERC funding mechanism (which was terribly under-subscribed), and to supporting universities which acted as subcontractors to industrial contractors (e.g., on MOST, at Dynacon we hired UTIAS as a subcontractor, and UBC as another one). This now seems to be changing, with CSA contracting out directly to some universities. I believe that CSA's new "grants and contributions" program (which is presently in the works) plans to carry that even further. University researchers also normally seek research contracts with industrial partners/customers. There's no general rule about how these proceed; it depends on the company in question but OCE has positioned itself to act as an enabler/promoter, trying to encourage companies that mightn't otherwise think of hiring Ontario university researchers to do so. Another encouragement is R&D tax credits; I believe that Ontario provides a direct tax credit to Ontario companies that hire Ontario universities to carry out research for them. And finally, there's the case where a university researcher has invented something that someone might want to make use of. In this case the university might have a commercialization or intellectual property department, which might pay for patenting the invention, and then helping the inventor seek out customers/partners for exploiting it. Money can then flow back to the university and the researcher via licensing fees; if the professor is feeling entrepreneurial he/she might choose to invest his/her portion of that back into further research and development, say via a professor-owned consulting company. There are probably some other programs and sources of funds that I haven't thought of, but the above covers most of what professors are ever likely to avail themselves (at least in Ontario). According to this article just posted on the BBC News website, "an expert panel has been asked to lay out the challenges and opportunities facing the British space industry." The new group (called the Space Innovation Growth Team) has been commissioned to deliver its assessment of the situation within six months and make recommendations on how government can help maintain the sector's competitiveness. The UK space industry turns over £6bn annually and supports some 70,000 jobs. The new panel will be chaired by Andy Green, the chief executive officer of Logica, a British based firm which provides IT support to other space focused organizations. The panel mandate from the British government is to outline a 20-year strategy by "identifying the key industry trends and then listing the actions industry and government need to take if they want to fully exploit the coming changes" according to the article. Why am I so cynical about these commissions? That's easy. I essentially don't believe that an institutional response to a problem (which is what I perceive of these commissions as being) is suitable in a situation where collaboration, innovation and action is required. Let's be blunt about this; politicians and government institutions form commissions when they don't know what to do or don't really want to do anything but need to create a perception of activity. They might even hope that someone in the newly formed commission will be bright enough to eventually write a proper report including at least one good idea which the public will either support or reject. But if the report is never finished, then no harm is done because the government has at least done something by commissioning the original report. If the report is ever completed, then the government gets to perform a second decisive action by either partially (or totally) accepting (or rejecting) the findings, an activity which can itself be stretched out into quite a large number of perceived and distinct decisions (which is really helpful for governments when they have trouble deciding things but need to convince the public otherwise). By focusing on a specific report or commission, we loose sight of the fact that there are actual things that need to be done and lots of us with some idea of what those things are and how to go about doing them who are likely to continue doing these things, even without formal encouragement. You know the type. They're the people who don't especially need to wait for a commission to "wrap up it's findings." But for the rest of us (those who really, really want to help develop "policy") there are also current tools which give each of us the capability to be heard and immediately influence ongoing debate at the highest levels (and that's what the discussion of space policy should above all be encouraging). So even if we'd prefer to have a committee to develop policy, there is no need to wait passively anymore for the final result. We can nudge them in the right direction and tell our governments what a space program should be doing whether it's exploration, education, R&D or industrial infrastructure development. Governments might even eventually grow to appreciate our viewpoints, comments and self evident (or self absorbed) answers. Clay Shirky, a writer on the social and economic effects of the internet offers below a couple of suggestions for moving forward and into a world where we can talk back to authority and not simply wait passively for commissions or governments to solve our problems. It's quiet today. Canadian astronaut Julie Payette is still on the ground at Cape Canaveral, Florida, while in Washington, DC. the Augustine Committee is also not yet quite airborne, as they meet and attempt to define the future of NASA (see the Space Politics blog for more details). But in the southern sun of New Mexico, the Virgin Galactic White Knight 2 prepares to buzz the tower at Las Cruces International Airport and the real future of spaceflight is being born. Meanwhile, back in Colorado, the Rockies Venture Club focuses on the profit potential for commercial space according to the local Rocky Radar, which bills itself as “Colorado’s Technology Record” and normally focuses on bio science and green technology. And at Howard Bloom's Big Bang Tango, experts in flash animation build space focused advertising that might even appeal to us ordinary folks. In fact, the reason why these activities seem to resonate so strongly relates to ongoing conversations I've been having with associates in the Canadian Space Commerce Association and the Canadian Space Society as to the appropriate activities for space advocacy organizations to engage in and the appropriate types of members to recruit for those activities. Members who actually build something once in awhile. Perhaps that something doesn't need to be quite so complex as White Knight 2 but maybe it could be an instrument package or a micro-satellite buss or even a magnetic torque rod mechanism for attitude control just so long as it's something either used in space or by people who go into space or by people who put other peoples things into space. Members who are knowledgeable regarding business fund raising; either venture capitalists like the Rocky Radar people, angel investors or perhaps just someone aware of the appropriate tax credits available from various government programs for research and development. Members knowledgeable in advertising and marketing who are comfortable advocating in public forums like the Big Blue Tango people and aren't just going to continue to preach to the converted. Not all of us subcribe to the above but a general consensus seems to be growing that space advocacy groups need to have more than just graduate students, fiction fanatics, dreamers and unemployed engineers looking to make connections for contract work as their core membership. Not every member needs to know or do everything on this list but the overall membership should contain a couple who can fulfill each individual item as required. Only then can space focused advocacy organizations begin to appropriately fulfill their mandates and start serving a useful role for their members. The United States and Canada partnered together on early Canadian space missions and part of what the US brought to the table was their launch capabilities. This historic partnership, while probably the main thing that allowed Canada to become a major space player in the 1960’s has been strained by various events over the last fifteen years but still continues with Canada's astronauts launching on the space shuttle for missions to the International Space Station. Here’s a partial list of Canadian government satellite launches (going back to the 1960’s) including some information on the launch provider and the rocket used. 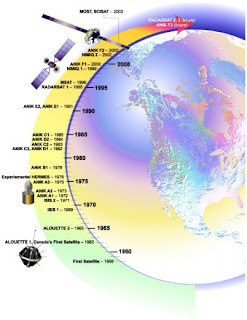 The list doesn’t include Telesat launches (13 Anik satellites, the 3 Nimiq satellites, M-Sat 1 and maybe one or two others), the various COSPAS/ SARSAT satellites (Search and Rescue Satellite-Aided Tracking) launched in partnership with the other signatories to the Cospas-Sarsat International Programme Agreement or the Can-X series from the University of Toronto, Institute of Aerospace Studies (UTIAS). Alouette 1 - NASA from the Pacific Missile Range, supported from Vandenberg AFB, using a Thor Agena rocket. Alouette 2 - NASA from Vandenberg AFB, using a Thor Agena rocket. ISIS-I - NASA from Vandenberg AFB, using a Delta rocket. ISIS-II - NASA from the Western test range at Vandenberg AFB, using a Delta rocket. Hermes – NASA from Cape Kennedy, using a Delta rocket. RADARSAT-1 - Vandenberg AFB, using a Delta II rocket. SCISAT-1 - Pegasus rocket launched from a carrier aircraft from 40,000 ft (it may even have been an L-1011, formerly owned by Air Canada although the links don’t explicitly state so). The basic design was American however, built by Orbital Sciences Corporation with a wing designed by Burt Rutan (who later went on to build SpaceShip One and win the Ansari X-Prize). RADARSAT-2 – Launched by Starsem from Kazakhstan's Baikonur Cosmodrome, using a Soyuz FG launch vehicle. So while the partnership endures, a quick look at the above data seems to indicate that Canada is moving away from our traditional close reliance on the US space program (at least for our launch vehicles). If we include the various Telesat satellites (with a wide range of US and other launchers being used) and the multiple UTIAS microsats (which use almost entirely non-US launchers) then we must conclude that Canadian satellite launches are not tightly tied to US organizations or corporations. The COSPAS/ SARSAT launches were a Canada US partnership with the participation of France and the old Soviet Union. As for our manned space program, even the CSA is promoting a tourist being launched through the Russian Federal Space Agency so they do seem to be at least considering their options for moving forward when the shuttle is retired. And this is as it certainly should be given that news sources like Space Politics are running articles on the Augustine Committee indicating that there is a sweeping reassessment of virtually all aspects of the US civilian space program presently underway. Maybe the CSA (certainly aware of the policy debate down south) is hedging their bets and expanding their capabilities outside of the traditional NASA channels for both manned spaceflight and unmanned satellite launches. There is a useful article from Wade Larson, Director of Business Development of Space Missions at MDA on the topic “Canadian Space Based ISR Comes of Age” on page 36 of the current issue of FrontLine Defence (the May/ June 2009 issue which unfortunately, hasn’t been posted on the website yet). He believes that the only “clear answer” to maintaining the required monitoring and security of Canadian territory is the development of a “coherent strategy” focused around a space based surveillance capability which would include the RADARSAT-2, the RADARSAT Constellation and the Polar Epsilon project. FrontLine Defense often publishes space focused articles highlighting the strategic requirements and “dual use” capabilities of many of the items in our present Canadian space program (of course, I’ve been a little biased ever since they published an article of mine in the March/ April 2009 issue). Other interesting recent space focused articles from FrontLine Defence include "Canada's Defence Space Program" by Colonel Francois Malo and "Saphire: Commissioning the D&D's First Operational Satellite" by Ken Krukewich, Glen Rumbold and Randy Shelly. Both articles ran in the November/ December 2008 issue. There is certainly quite a bit of overlap between the military, the aerospace and the space focused communities in Canada and commercial space entrepreneurs should be aware of these links. Even the next Canadian Space Summit (organized around the dual use theme) is being held at the Royal Military College in Kingston, Ontario from November 20-22nd. I am scheduled as session chair of the commerce and commercialization track for the Summit so perhaps we'll see each other there (and does anyone have any suggestions for topics we can use for the sessions?). The Cambridge, Ont. company earned C$4.9 million or 7 Canadian cents a share in the latest quarter, up from C$2 million or 3 Canadian cents in the year-earlier second quarter. Revenue rose to C$64.1 million from C$54.2 million a year earlier, with 58% of revenue in the latest quarter coming from the commercial market segment, 26% from civil, and 16% from military. 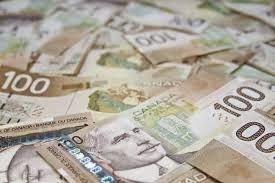 Analysts were projecting earnings of 7 Canadian cents a share and revenue of C$61 million in the second quarter. In essence, space focused businesses are profitable, even in the midst of a recession. So what are these businesses and how do we find them? That’s easy. Most of them are listed in the Canadian Space Directory. Maintained by the Canadian Space Agency, this list is a pretty good introduction to the companies and organizations working directly with the CSA on space focused activities. Some of the larger firms on this list include Telesat, McDonald Dettwiler and Associates (MDA), COMDEV International and Magellan Aerospace. A look at the history of these firms will reward policy makers and potential entrepreneurs by providing useful lessons on the underlying mechanisms and policies needed to effectively grow the aerospace and newspace industries in Canada. The Canadian Venture Capital Association with 600 plus venture capital firms and angel investors who are always interested in new business opportunities even in the present economic times. Canadian based CRA SR&ED credit financing firms like Goldeye Capital, Expert Solutions, SR&ED Funding Consultants and other firms involved with this sort of government funded innovative development which is the single largest source of federal government support for industrial R&D. Organizations focused on the commercialization of basic science like PreCarn Incorporated, the MaRS Discovery District Innovation Center and others. Most of these firms would also have connections in universities doing basic space focused R&D. I just finished reading an article on Canada’s first space tourist at http://www.newscientist.com/blogs/shortsharpscience/2009/06/canada-embraces-its-fire-breat.html and really, really need to ask the obvious question. Why didn’t Guy Laliberté contribute some of that estimated 20 million USD’s spent to get his slot aboard the Soyuz capsule on some of the other potential competitors to the Russian Federal Space Agency (RKA)? The Russian agency is the only group selling this service at present, but that isn’t to say that the space tourism market will always remain a monopoly. Our Canadian equivalents to Bob Bigelow, Elon Musk and all those other American newspace people should be lining up outside the doors of the Cirque du Soleil offices to offer Mr. Laliberté a lower cost alternative for the next time he wants to go into space. Space tourism is a serious moneymaker for the RKA (which seems sort of ironic, now that I think about it). There should be more than one supplier for this service, especially given that the existing supplier is using 50 year old technology and infrastructure. Canadian Space advocates fill a unique position between governments and their agencies (like the CSA or the Department of National Defense) who develop and implement policies relating to space activities, universities (where most of the basic science is developed) and businesses like Telesat, MDA Space Missions or COM DEV International who do most of the actual building of things that relate to or get sent into space. They belong to a wide variety of public, private and educational Canadian based organizations overlapping in members and expertise and with seemingly contradictory mandates. Try to introduce yourself to someone in a specific organization and you could start to feel a little like Brian in the Coliseum, attempting to join the Judean Peoples Front. The Aerospace Industries Association of Canada (AIAC) bills itself as “a member driven not-for-profit national trade association that promotes and facilitates Canadian competitiveness in the global market for aerospace goods and services.” They’ve been involved in a number of initiatives including the 2005 Canadian Aerospace Partnership but focus on space related activities primarily as an R&D subset of the larger commercial aerospace market. Similar organizations also exist at the provincial level and for a comprehensive list of most of the other Canadian aerospace industry focused organizations please check out the Ontario Aerospace Council). Athena Global is a privately owned think tank focused on “bringing space solutions to terrestrial problems” according to its website. They have written various position papers and orientation papers on a variety of topics including Space and National Security, Climate Change and Variability and other topics available for download on their web site. The Calgary Space Workers Society is a not-for-profit science club with the desire to “live and work in space” founded in 2004 “to build a space habitat or lunar station.” They hosted the 2007 Canadian Space Summit. The Canadian Aeronautics and Space Institute (CASI) is a non-profit scientific and technical organization for people interested in aeronautics, space and remote sensing. Formed in 1954 when the Montreal based Institute of Aircraft Technicians, the Ottawa Aeronautical Society, and the Canadian sections of the U.S. Institute of Aeronautical Sciences combined, CAISI is the oldest focus for communications and networking among the Canadian aeronautics and space community. Canadian graduates and alumni of the International Space University (ISU) have organized a not-for-profit organization called the Canadian Alumni of the International Space University (CAISU) which focuses on “informing any interested party about space events in Canada” and “organizing conferences promoting space awareness among university level students, professionals and the community in general.” Their most recent National Space Awareness Workshops (for 2006 and 2008) are available online for download. The Canadian Aviation Maintenance Council is a not-for-profit sector council that represents and assists Canada’s aviation and aerospace industry with its human resource strategy, issues and solutions. The Canadian Space Commerce Association, a collaboration of Canadian entrepreneurs interested in the commercial opportunities available in the development of space. They helped organize and hosted a commerce and commercialization track at the 2008 Canadian Space Summit. CANEUS is a Montreal based, worldwide focused non-profit organization catering to the needs of the aerospace engineering community by fostering the coordinated development of Micro-Nano-Technologies (MNT) for aerospace applications. Their key focus is to find rapid and cost-effective methods for transitioning emerging MNT concepts through the “Valley of Death” for technology development. Project Plowshares which compiles the "Space Security Index." The Rideau Institute on International Affairs an independent research and advocacy group focused on space security looking to build a public consensus on rebuilding Canadian space capabilities (among other things). Their most recent report on “The State of the Canadian Space Sector” is available on their website. The Secure World Foundation, although based in Colorado, this non-profit organization focused on space security and disarmament issues has a worldwide reach and lists Canadian based Project Plowshares and The Rideau Institute as partners. Activities include space situational awareness, space traffic management, mitigation of orbital debris and other areas. The sponsors "The Space Show" with Dr. David Livingston which is one of the best known and most respected new media outlets focusing on commercial space and related topics. Space Canada is an organization dedicated to facilitate “dialogue on space generated solar power.” The founding members (several of who were once actively involved in the Canadian Space Society) are organizing an international symposium on space based solar power generation in Toronto for fall 2009. Students for the Exploration and Development of Space (SEDS) is a high school and university focused group dedicated to expanding the role of human exploration and development of space. The Canadian chapter website (under the name U of T Astronomy & Space Exploration Society) and the University of Waterloo (under the name Waterloo Space Society) are good sites to visit.